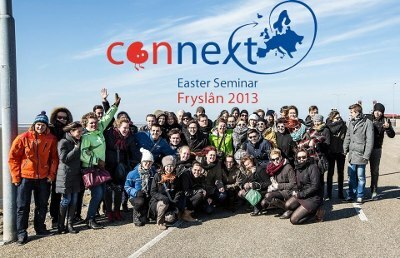 From 23-29 March 2013 the language diversity team participated in the Easter Seminar of the Youth of European Nationalities (YEN) in the Frisian village of Grou (the Netherlands). The seminar was attended by more than 90 youth representatives from 25 different minorities in Europe, among them: Frisians, Danes, Sorbs and Western Thrace Turks from Germany, Kashubians from Poland, Carinthian Slovenes and Burgenland Croats from Austria, Ladins and Germans from South Tyrol, and Aromanians from Albania, Macedonia, Serbia and Romania. 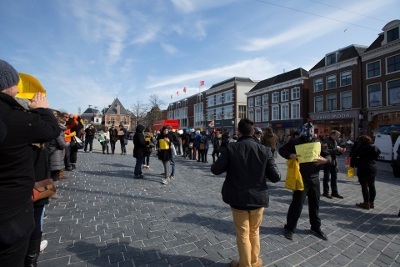 The team used the event to implement its campaign for multilingualism and linguistic diversity in the region of Friesland. 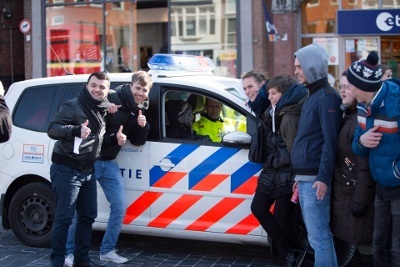 At the same it acted for the first time as “language diversity police”, and tested the profession of police officer as ambassador for the campaign. The team was there for the whole week and organised different activities. Supported by the more than 100 participants we called for attention among the inhabitants of the region for linguistic diversity, minorities in Europe and for the region of Friesland, with spontaneous actions across the small village of Grou and with a larger flashmob in the centre of the town of Leeuwarden / Ljouwert. It was our goal to use the youth from all over Europe as multipliers for linguistic diversity and with the help of passers-by to raise awareness for multilingualism. We showed the Frisian minority, but also the Dutch majority population, that we are of the opinion that the Frisian language is important and that in Europe there are many more languages besides Frisian. 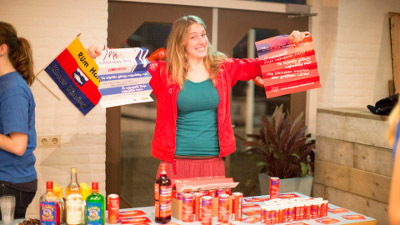 With large signs with messages in different languages and crazy group poses we attracted attention from the passers-by. Every passer-by had to choose one of the “language gates” – formed by two speakers of a minority language, in order to continue his way, and then learned how to say “hello” or “cheers” in Danish, Croatian, Sorbian, Aromanian and many other languages. The saying “Praat mar Frysk” (just speak Frisian) on our sweets and our colourful products pleased everyone. Together with the young participants from all over Europe, but in particular with the people living in the regions we focus on in our campaign – like Lusatia and the German-Danish border region – we held interviews about languages and identity. We recorded these interviews and all our activities in short films and podcasts. 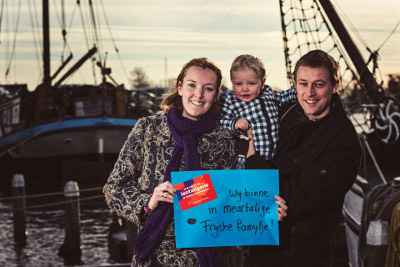 Furthermore the team spoke with the promotors of the Frisian language – Afûk – and established important contacts to the campaign “Praat mar Frysk” (“Just speak Frisian”).